Thousands of motorists have been caught driving through a new bus gate in Taunton, earning the council more than £107,000 in fines. Many motorists say the warning signs on Bridgwater Road are not clear enough but this is disputed by the authority. The restrictions came into place on 10 August and were enforced from 16 October. More than 5,000 drivers were caught between then and 12 December. 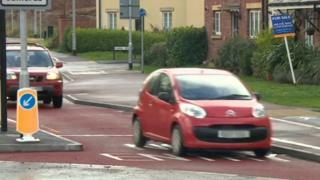 Somerset County Council said fewer than 1% of drivers ignored the restriction. A bus gate is a short stretch of road that only buses are allowed to use. Councillor John Woodman, who is responsible for highways, said the number of drivers using it was falling. "It started off at about 100 a day and now it's down to 60. We would like it to be zero," he said. BBC reporter Clinton Rodgers said in 45 minutes he was filming at the site he saw 10 vehicles going through - including three in quick succession. He said some of the drivers he spoke to did not understand what a bus gate was. In August 2013 motorists paid more than £250,000 in fines over an eight-month period for passing through two bus gates. Speaking then, a council spokesman said the money raised from the Dean Gate Avenue and Mountway Road schemes would be used for "enforcement and maintenance costs" with any surplus being reinvested in transport projects.